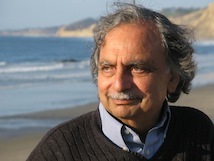 Farooq Azam, Ph.D., University of California, San Diego, has won the 2013 D.C. White Research and Mentoring Award. This award is named in honor of D.C. White, who was known for his interdisciplinary scientific approach and for being an inspiring mentor. According to his nominator, Antje Boetius, Alfred Wegener Institute, "Azam is known for his inspiring, entertaining and visionary lectures, awakening legions of students and investigators." Azam is Distinguished Professor of Microbial Oceanography at Scripps Institution of Oceanography, University of California, San Diego. He is a Fellow of the American Academy of Microbiology (AAM) and has received numerous, notable honors and awards for his research contributions to marine microbiology. Over the past three to four decades he and his students and postdocs have made fundamental contributions to our understanding of the role of microbes in the functioning of marine ecosystems and the ocean carbon cycle. They have developed novel concepts and methods that have transformed marine microbiology into a quantitative and mechanistic field integrated with related disciplines of oceanography, biogeochemistry and climate science. This has contributed to an explosive expansion of the field attracting new talent and opening up new disciplines like marine molecular ecology. Azam is considered one of the primary founders and leaders in the development of concepts and methods in the emerging field of microscale ecology and biogeochemistry of marine microbes. He is seeking to develop a unifying mechanistic framework for the role of microbes in ecosystem function and resilience, to help predict the response of the diverse ocean ecosystems to climate change. His research is within the broad context of the significance of marine microbes in global habitability. Azam trained under Arnost Kotyk, Microbiology Institute, Prague, studying sugar transport in Saccharomyces cerevisiae, followed by post docs at Stony Brook University, under Vince Cirillo, and Scripps Institution of Oceanography, under Ben Volcani and Oz Holm-Hansen. While at Scripps he recognized that marine microbiology was ripe for fundamental change. As a mentor Azam is passionate about teaching and guiding research, and his graduate students and postdocs have done brilliantly. He takes much satisfaction in their achievements. A number of his graduate students have received national and international awards and honors. Of the sixteen Marine Microbiology Investigators appointed recently by the Gordon and Betty Moore Foundation, four recipients of this highly prestigious honor were Azam's former students or postdocs. Perhaps reflecting the disciplinary breadth of their training his students and postdocs have, in their own right, made transformative discoveries and opened up and developed new facets of marine microbiology and microbial oceanography. Newly elected AAM Fellow and one of Azam's former post docs, Forest Rohwer, San Diego State University, describes the impact that Azam has had on his career. "Entering his lab, I had a completely wrong background. I was trained as a human immunologist with some virology knowledge. And I was headed to law school. Then Farooq give a talk about all of the viruses in the ocean. I dropped the law school and went to Farooq's lab, even though he had very little money at the time. I then dragged Farooq into the genomic sequencing, which spent all of his grant money. Through all of the resulting chaos, Farooq calmly taught me marine microbial ecology every day at lunch and over coffee. When we finally finished the first genome of a marine creature (Roseophage SIO1), Farooq massaged the story to make it relevant to the field. This paper launched my career, showed the power of genomic approaches to the marine microbial ecology field, and directly led to the first shotgun metagenomes (also viral)." Azam continues to make a lasting impression on his former and current students, as well as his field. Dr Farooq will present "Microbial Structuring of Marine Ecosystems: Significance of Microscale Interactions" at the 113th General Meeting of the ASM.